Herrera-Camacho José-Abel. He received degrees in Mechanical-Electrical of Engineering, Master on Electronic Engineering, and the Ph.D. Engineering, from Universidad Nacional Autónoma de México (UNAM), in 1979, 1985, and 2001, respectively. The Ph. D. was with support of the University of California in Davis, USA. He did a postdoctoral research at Carnegie Mellon University, USA, and a sabbatical research at USC, USA. 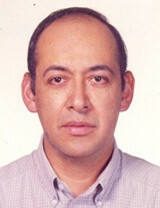 He is author from more than 50 scientific papers on codification, recognition, and synthesis of speech, and created various laboratory recognition and synthesis systems for Mexican Spanish Language; in particular, an electronic speech commands recognition system for doors, curtains, light bulbs and lamps, a software continuous speech recognition, a software speaker recognition system, and a software natural and emotional speech synthesis system. He was expert of UNAM for Speaker Identification at a legal trial from 2006 to 2009. He has written two books, the last one is Linear Algebra, Theory and Exercises; was written at 1986, it had 9 printouts until 2010, since 2011 is free at internet for UNAM students. He has been computer engineering department head, signal processing department head, engineering graduate school deputy director, and in charge of the Processing Laboratory at Engineering School of UNAM.